You can create coupons to reward certain customers/subscribers after setting up price for your content or items in Muvi kart. Your customers/viewers can use the coupons to buy PPV (Pay Per View) content, PPV bundles and also buying items in Muvi Kart (If you have enabled Muvi Kart, Coupon value is only applicable for product’s price, not applicable for shipping price). Coupons can be used for subscriptions. Users can use coupons to get cash discount while paying for their subscription fee. (Note: This is only applicable for the first subscription). You can also create cash coupons which can be used as cash. You can create "Once Use" coupons (Users can use this coupons only once) and "Multi-Use" Coupons (Users can use this coupon multiple times). Coupons can be created to used to watch all content or to watch specific content. There's no charge for creating coupons, and you can create as many coupons as you wish. Note: You need to add a Payment Gateway to create coupons. Before creating any Coupon, first you need to enable this feature in your CMS. To enable Coupon, go to “Monetization” --> “Settings” in your CMS. Coupons will be enabled for your store. Once Coupon is enabled, it will be displayed under the Monetization menu. You can create "Once Use" coupons which users can use only once. To create new coupon, go to “Monetization” --> “Coupons” in your CMS. 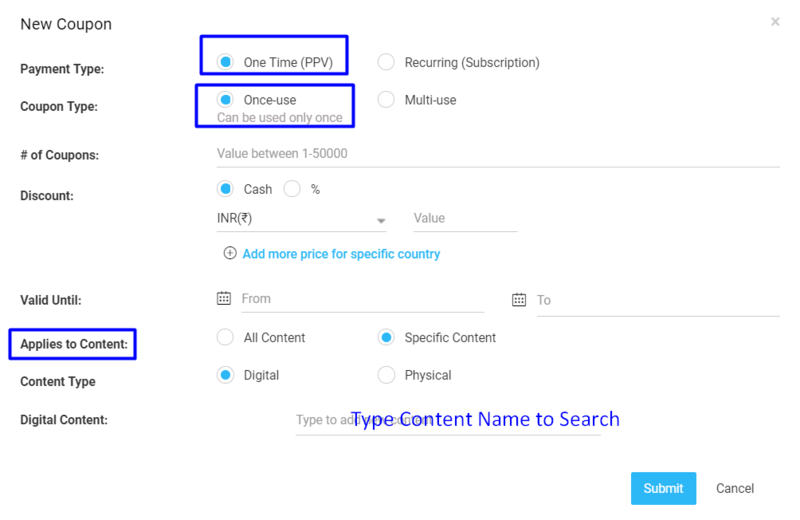 In "Payment Type", select "One Time (PPV)"
In # of Coupons, type a value between 1 – 50000. Click on “Add more price for specific country”, if you want to add different currency. In "Applies to Content", you can either select "All Content" or "Specific Content". If you select "All Content", the coupon can be used to watch all types of content. If you select "Specific Content", then the coupon can be used to watch specific content added by you. You need to type the content name in the search bar to add. You need to select "Digital" or "Physical" from the option. If you select Digital, then the coupon can be used to watch digital content. If you will select Physical content, the coupon can be used to buy physical goods in Muvi Kart. You can create "Multi-Use" coupons. Users can use the same coupon for multiple times. To create Multi Use Coupon, go to “Monetization” --> “Coupons” in your CMS. A Coupon Code will be generated automatically if you select “Multi Use”. Your users can use this coupon for multiple times to view content in your website. Note: You can rename the Multi Use coupon code. For example, if the Multi Use coupon code is generated as 6FGHJK, then you can rename it to CHRISTMAS10 if you plan to offer 10% discount during Christmas or CASH20 if you plan to offer $20 cash discount and so on. You can create Recurring(Subscription) coupons for your users. Your users can use these coupons to get cash discount while paying their first subscription fee. This can be used only once. To create new Recurring(Subscription) coupon, go to “Monetization” --> “Coupons” in your CMS. 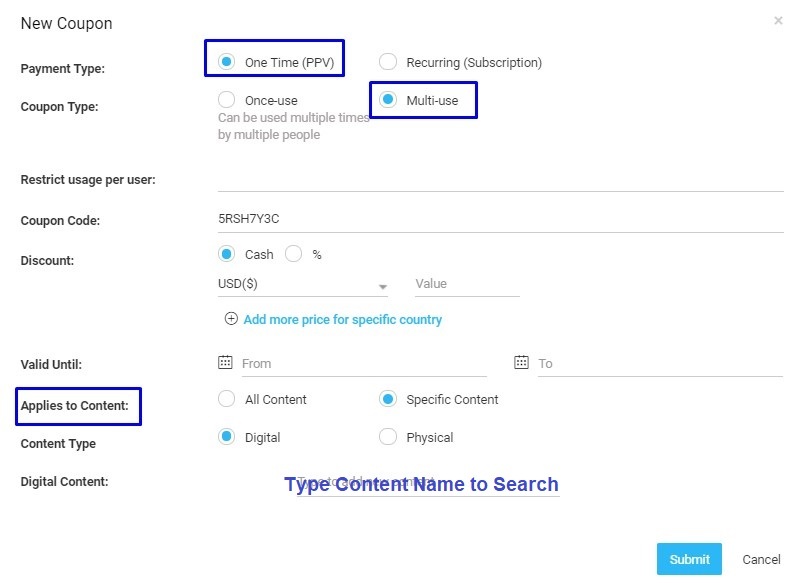 In "Payment Type", select "Recurring (Subscription)"
You can select "Multi-Use" to create multi-use coupons which can be used multiple times by multiple people. If you select "%", then you need to mention the percentage of discount which the users will get on the subscription amount. 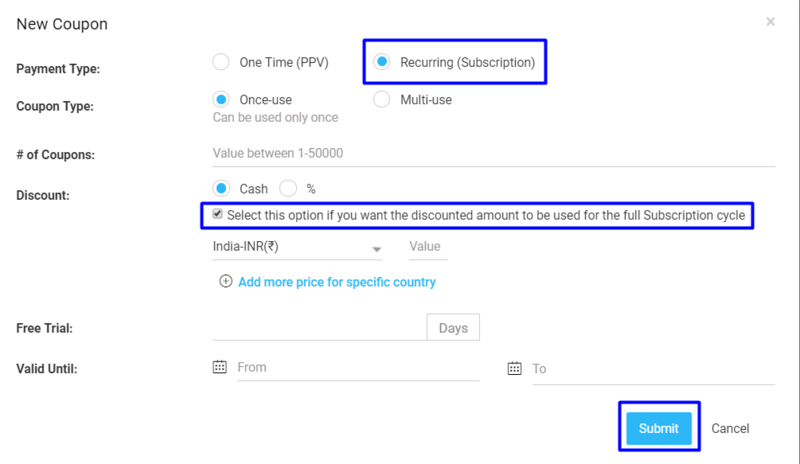 Select the checkbox for "Select this option if you want the discounted amount to be used for the full Subscription cycle" if you want your users to get the discount on subsequent subscription renewal. Once you create the coupons you can see their status under Coupons page. You can view the status of "One Time (PPV)" and "Recurring (Subscription)" coupons separately. Here you can see the Coupon Number, Coupon Type, Validity, Used/Not Used, User who used it and Use Date. Click on a particular coupon to see its status. You can search a particular coupon by typing the coupon name in the search box and view its status. To download the Coupon Status, click on “Download CSV”. Your coupon status will be downloaded in Microsoft Excel. If you want to delete coupon/coupons, you can do it through the CMS. In the Coupons page, select the check box in the left-hand side of the coupon and click on “Delete”. When asked for confirmation, click on “Yes” to delete the coupon. If you want to delete multiple coupons, then select the check box for the coupons you want to delete and click on “Delete”. Once you created the coupons, you can give it to your users to watch videos. The users need to type the coupon code and click on "Apply" to purchase the content. At the time of registration, users can use the Recurring (Subscription) coupons to get cash discount. Note: The coupon filed will be activated once you filled up the "Name", "Email Address", "Password" and "Confirm Password" field.